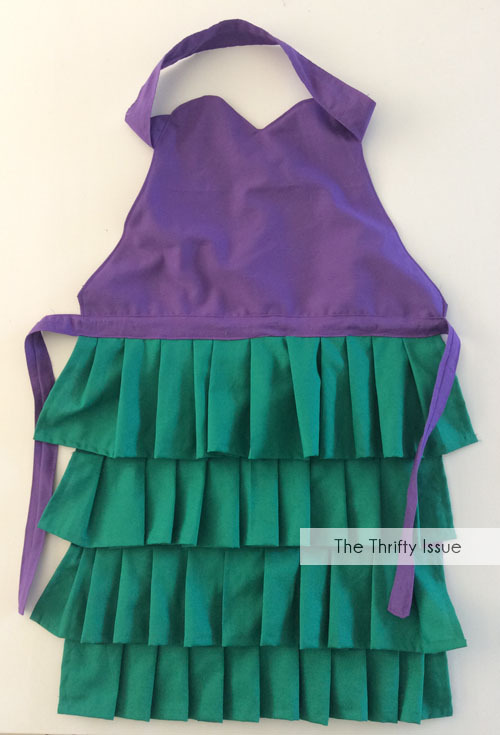 My daughter was invited to a Little Mermaid party a few weeks ago and the birthday girl loves to cook so we decided to make her a special apron inspired by Ariel. It was fairly simple to make and looked stunning when finished. I want to make one for myself! I use this tutorial I posted earlier for the apron. Make sure you read though the tutorial for making an apron so you know what is happening. This apron just has a few modifications which I will go through here. I cut the top of the apron in a curve to get the heart shaped neckline. If you are cutting while the fabric is folded in half then you only need to cut one circular shape as when you open it up it gives the double bump. Make sure you do that for both the backing and topside. I cut one really long (entire width of the fabric) and 3″ wide purple strap as it will go over the whole apron and hang on either side for a tie. Also cut a shorter strap for around the neck. From the green I cut 5 strips the entire width of the fabric about 5″ or so wide. These strips need to be at least twice the width of the apron or more depending on how big you are making your ruffle folds. Once everything is cut hem 3 sides (2 short one long) on each of your green strips. 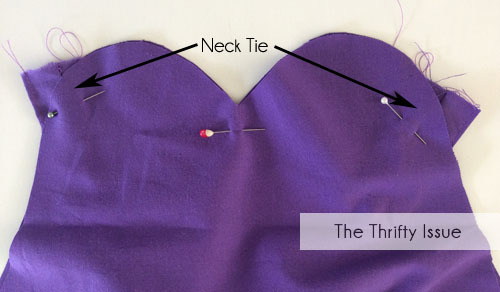 Sew the short purple strap into a tube and turn in the right way then top stitch. 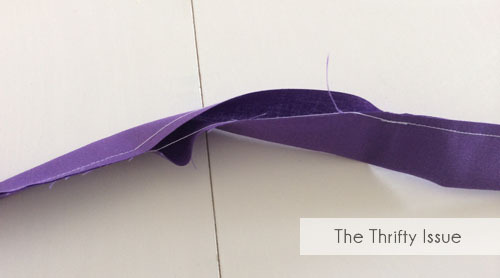 Sew the long purple strap into a tube but leave a gap in the middle where you will be able to turn it because you also need to sew both ends closed, as shown above. Then turn the tube right side out. Do not top stitch this one yet. Sew the top part of the apron to the backing making sure to include the neck strap and turn right side out. To help get a curve when you turn the neckline cut small ‘V’s in the edge all around and poke with a chopstick or similar after its turned. Iron flat to help it maintain the shape. Top stitch the whole way round, Hemming the backing as you go. Next you are going to line up the ruffles. Starting with the bottom ruffle pin the raw (unhemmed) edge to the backing but place it so that the long hemmed edge faces toward the neck line instead of the ground. 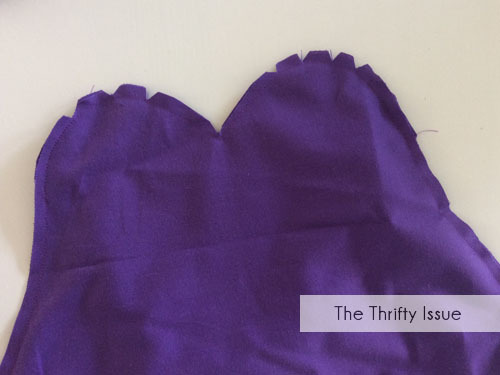 Make your ruffles by folding the fabric back over on itself an inch or so. Do this the entire width of the apron. You may need to adjust as you go to make it fit nicely and not have massive ruffles ones side and small ones on the other. 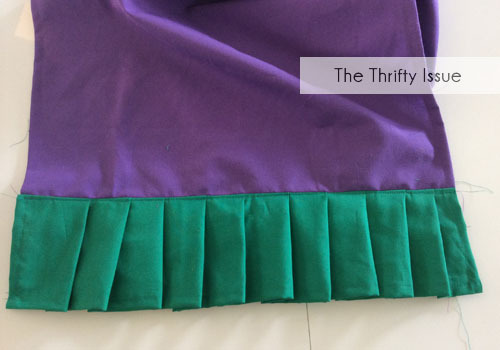 Once you are happy with your ruffle size straight sew it onto the apron. Now fold it down from the top and top stitch the same line. 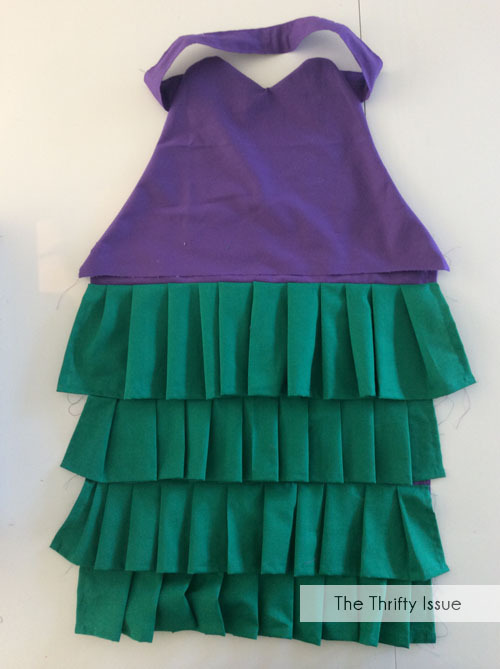 Repeat for the remaining ruffles and space them so that the last one is level with the top of your purple front section. 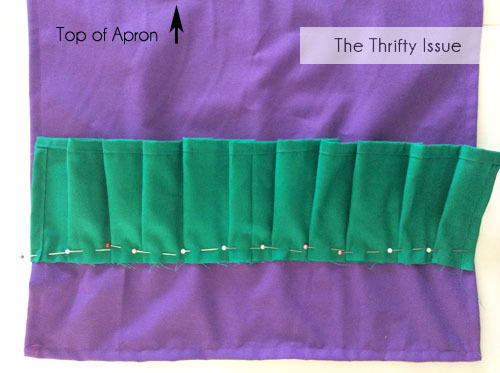 Once all ruffles are on sew the long tie in place by top stitching it to the whole apron around the middle. This will also hide the join between ruffles and top. And there you have it, an Ariel mermaid apron. This would also look good in all yellow as Belles dress from Beauty and the Beast too. What are your kids favourite movies? Have you made anything inspired by them? Oh my goodness! Do you think this would fit a petite 3 year old!? She would LOVE this apron! Absolutely. 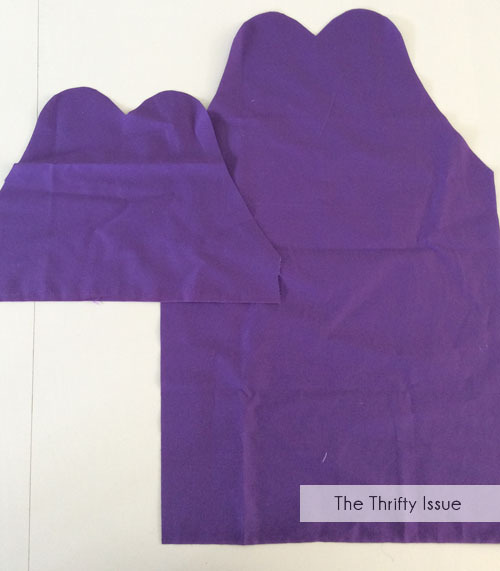 The tutorial linked to for the actual apron is based on the shirt size of your own child so you can make it from tiny toddler through to adult.